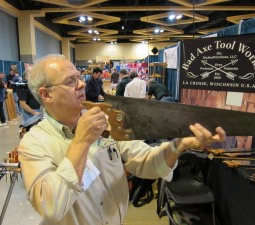 Bad Axe Tool Works - Is My Vintage Saw Worth Tuning Up? Is My Vintage Saw Worth Tuning Up? Here's the key thing most people miss before buying a vintage saw for restoration & sharpening, and it's critical: does the plate still hold it's temper and stiffness? I see saws every week that people spend good money shipping to me, only to report back to them that they're not worth fixing. These are saws whose sawplates are hopelessly kinked or out of temper, and the plate is simply stiff no more. These old soldiers have done their duty and must be retired, because like an alley-way drunk on skid row, they will drift along in a cut and simply not pull their weight in your workshop. 1. Grasp the (handsaw) by toe and heel. Flex it into a circle. Don't worry--it won't break--it's made out of spring steel; it's supposed to flex. Now let it relax, or 'spring' back into straight. Repeat the process in the opposite direction. 2. Now Sight down the toothline like you would a rifle sight. Any kinks or bows will present themselves. The key thing you're looking for, is whether the plate remains flexed in the last direction you flexed it. 3. Repeat the process a couple of times with both sides to determine whether or not this saw has 'perma-flex,' in the direction you last flexed it. Remember--it's spring steel, and it's supposed to flex back to straight, or close to it. 4. If there is no permanence in the flex, and the bows/kinks aren't too severe, then you have a saw worth saving (that is, assuming the rust hasn't ravaged deep pits in the plate). 5. 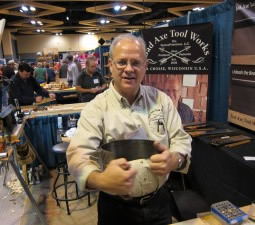 THEN send it to me to hammer-smith straight (or one of the other guys in the saw restoration & sharpening business, like Marvin Werner, Matt Cianci, or Daryl Weir, to name a few of really good saw docs). Remember that this procedure is easily overdone, and will result in about the 80-90% solution. Your saw will always be a little weaker in the area where it was straightened out, so exercise caution when sawing--as you would anyway. 6. There is one caveat, after determining whether your plate has retained sufficient temper/stiffness, and that has to do with how brittle the plate is. This affects the set of the teeth. 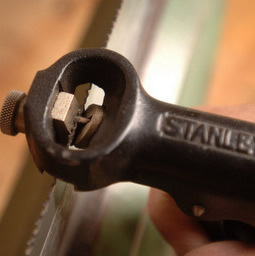 Tthe older the saw, the more likely it is that the metal has crystallized over time and become far more brittle. This has a major impact over whether you can set the teeth. Even the most minor set at times can cause an old, brittle tooth to snap off. It's a judgement call, so if your saw is older than the late 1800's, know that this can possibly happen. 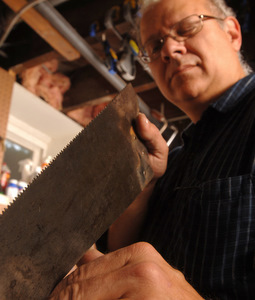 Now as for backsaws: it's rare that I see a backsaw plate that has been kinked beyond repair. Oftentimes, it's the back itself that has been dropped, stepped on, or somehow bent out of true. Unlike the hardened spring steel of the sawplate, the backs from these old vintage saws are often just pretty darned close to iron: malleable, low-carbon steel. The function of the back is to simply stiffen the thin gauge of a backsaw plate, and lend some weight to the equation when making fine cuts. The best fix for a backsaw is to true the back into alignment with a couple of crescent wrenches and a big vise, along with some (very) judicious tapping of the plate, if in the judgment of the saw fixer, the plate warrants that. 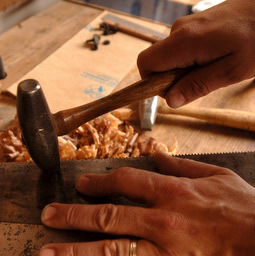 So--when all is said and done, flex your vintage handsaws before purchasing one with the intent of sending it in to me or one of my contemporaries for sharpening and restoration.